Welcome to the ideal post of tranquility on your tour to Yala- Sri Lanka. Stay with Chenra Hotel to enjoy the harmony of life and nature while exploring the wilderness of Yala. Your experience would be unique and memorable with comfortable Cottages with all the modern amenities together with pool facilities and spacious dining area where our chefs would be serving you with mouth watering delicacies. 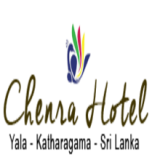 Dear visitors & guests, Make reservations to be delighted with Chenra Hotel and carry away a last long pleasing memory.